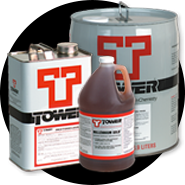 Tower Products, Inc., is a leading manufacturer of environmentally sensitive pressroom chemistry based in Easton, PA. In 1986, Tower introduced the first full line of roller and blanket washes free of all carcinogenic and reproductive toxic materials, and without being flammable. The company also holds a US Patent on its low emissions ink-cleaning technology sold under the trade name LO-VO WASH. Within a few years, Tower has become the fastest growing manufacturer of pressroom chemistry in the U.S.A. Tower products are now manufactured across the United States and Canada, as well as our main facility in Easton, PA. These locations service our North American dealer network and customer base. Tower manufactures a full range of pressroom chemical products that perform without sacrificing worker safety and improve environmental compliance. The company maintains more than 25 OEM product approvals for automatic wash equipment, cleaning technologies and fountain solution products, including products with FOGRA certifications. 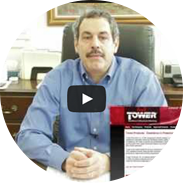 Tower provides a toll-free 800 hotline to our dealers and their customers for technical questions: 800-527-8626. Our web site, www.towerproducts.com, contains the latest information on our products including technical specification sheets and Material Safety Data Sheets on a 24/7/365 basis. Users of Tower products represent a true cross section of the printing market, from the small copy shop to giant newspapers like the Chicago Tribune and the Hartford Courant; from high quality sheet fed operations like Intelligencer Printing, Everett Graphics and Marek Litho, to commercial web printers like Brown Printing and R.R. Donnelley and the financial printing giants, Moore Business Forms, Deluxe and Clarke American. 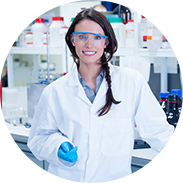 Tower products are truly: Excellence in Pressroom Chemistry!